Bärenstark im Winter: der Titus Centerfold Bruno Zip-Hoodie! Mit dem Titus Centerfold Bruno bist du bestens auf kalte Temperaturen vorbereitet, denn im Rumpfbereich und in der Kapuze, dank Tunnelzug regulierbar, ist der Zip-Hoodie mit kuscheligem Teddy-Fleece ausgekleidet. Die Ärmelinnenseiten sind angenehm weich aufgeraut und elastische Ripp-Bündchen verleihen einen eng anliegenden Abschluss, so dass rundum für Gemütlichkeit gesorgt ist. Typisch Zip-Hoodie bietet die aufgesetzte Känguru-Tasche, vom durchgehend verdeckten Front-Zip geteilt, etwas Stauraum und bei Bedarf auch warme Finger. Feine Labeldetails, wie das kleine Titus-Icon-Stitching links auf der Brust oder das gewebte Loop-Flag rechts am Saum, runden den Centerfold Bruno dezent ab. Cool hoodie! S = 176. A great piece to wear over something with a very warm and soft lining. 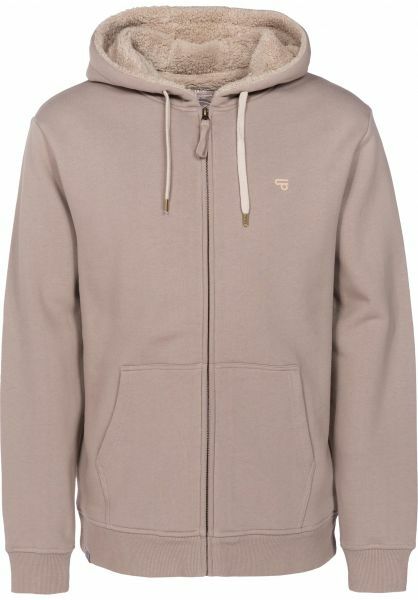 Nice zip-hoodie with teddy fleece lining. The arms are not lined so its easy to put on an extra jacket over it. It's super warm. The fit is just like the Titus Centrefold hoodie without fleece lining. Two thumbs up! I waited until I washed this hood 2-3 times before writing my review - and I was totally surprised! The soft inner lining is still like new! This hoodie keeps you really warm and the lined hood is extra nice. Super soft and warm pullover. Perfect for the winter. I'm 1,90m and pretty skinny, M fits perfect. I've crossed the North Pole with this hoodie and afterwards only my arms, legs, and head had to be amputated. My body stayed nice and warm :) For the price, you will save on your heating bill the cost in a month! Extremely warm but also lightweight and comfortable to wear. The inner lining is super soft and through the whole hoodie except the arms. The perfect hoodie with really nice quality at a fair price. Respect Titus! Warm wool lining but it looks thin and stylish on the outside. Big hood with a relaxed feeling fit. The most comfortable hoodie I think I've ever had! Not too thick or too thin. Perfect for skating during cold winter days! I recommend. Super soft and cozy hoodie in classic Titus quality. Keeps you nice and warm. The arms are not lined so you can move them around freely. It's also stylish which makes it great for wearing often in the winter. Pull super douillet et chaud. Parfait pour l‘hiver.